Scary Mary propels a Halloween cruise that seems otherwise becalmed in the same old haunted seas. Have we mentioned that Scary Mary is really...well, um - scary? It's been over a week since we attended the opening of Queen Mary Dark Harbor, yet still she haunts are nightmares. That little girl is Creepy with a capital "C," and her maze is the highlight of the ship's Halloween cruise, thanks in no small part to her deranged and disturbing presence in the dark and dank hallways. Scary Mary is leagues ahead of Dark Harbor's other characters: Samuel the Savage and Half-Hatch Henry are virtual non-entities; the Captain is a one-note authoritarian with a skin condition; the Ringmaster is hopelessly out-of-place in an aquatic setting; the Voodoo Queen has a certain exotic appeal but no real haunting grounds since she got kicked out of her maze; the new Iron Master is supposed to be an irate Irishman, but his accent sounds more Liverpool than Limerick. Only Graceful Gale comes close to rivaling Mary, but even her silent, hypnotic beauty is no match for the terrifying tot's childish animosity. In fact, now that we think of it, Scary Mary is the most grotesquely amusing character of any Halloween haunt in Los Angeles. The Six Flags Magic Mountain Fright Fest has the Joker and Harley Quinn, but they're not really Halloween characters. The Knotts Berry Farm Halloween Haunt has the Green Witch, who's great, but like Snow White's wicked step-mother, staring into the magic mirror, she must learn to accept her second-best status. Halloween Horror Nights at Universal Studios Hollywood has Freddy Krueger, Jason Voorhees, and Leatherface, but they are just spring-loaded, sock-puppet versions of their true selves. None of them can hold a bloody candle to poor Mary, drowned and dead, but eager to play with you...forever. We can nitpick many details in the Queen Mary's 2016 Halloween voyage, but Scary Mary makes makes it worth your while to book passage again. In two words: not much. When the Queen Mary revised its Halloween haunt into the Dark Harbor back in 2011, the ship set sail on a bold new voyage into stranger seas, but for the past two years, its progress seems to have slowed. It's not exactly off-course, but it does seem a bit adrift, reaching only three or four new ports of call. One major change is that Dark Harbor has dropped the introductory scenes that set the stage for some of the mazes in 2015. Though entertaining, these scenes slowed down line-flow while small groups of passengers waited for the scene to finish. Instead, any back story for the mazes is now conveyed by a series of signs posted along paths where passengers wait to board. Evicted from her village, the Voodoo Queen now tends bar. Another development is that the old Fisherman's Village is - for the first time in as long as we can remember - not being utilized as a location for a maze. Instead, it has been pushed into service as the Voodoo House Bar and Tasting Room. The concept sounds intriguing - a bar hosted by the Voodoo Queen herself! - but there is actually only a minimal atmosphere to the place. Some roving waitresses in fabulous skull-faced makeup roved around outside, selling "voodoo shots," but indoors the cashiers and bartenders were not costumed, and we had little or no sense of inhabiting a haunted voodoo swamp. 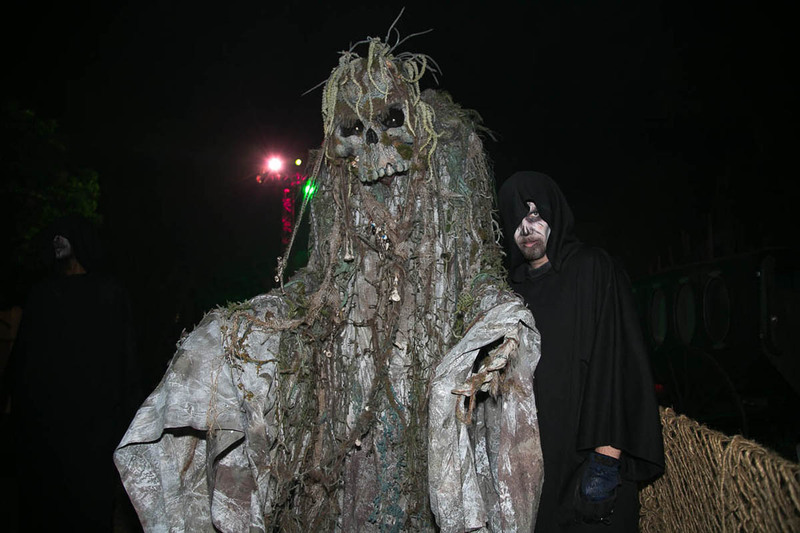 The absence of a maze in Fisherman's Village is a major loss for Dark Harbor. It's always been difficult for the haunt's landlocked mazes to compete with the creepiness of the Queen Mary's corridors. With its old-fashioned architecture, the village offered a perfect setting for old-school haunting that was seldom matched by the artificially constructed mazes in the Dome. The new Intrepid maze can hardly fill the void created by the loss of this splendid location, which over the years has hosted vampire, zombies, and many other traditional Halloween monsters. The transformation of Fisherman's Village into a bar seems to represent a new course for the Queen Mary: drinking establishments are more prominent than ever: not only is there the old RIP Lounge; there are also at least two other watering holes. In fact, one can barely turn a corner without finding a place to drink; bars have become Dark Harbor's equivalent of Starbuck's. Our favorite newbie is Panic, a "4-D virtual experience" consisting of a 3-D movie enhanced with in-theatre effects, including vibrating seats creepy crawlies at your feet. The film itself used computer-generated animation to simulate a speedy trek through a haunted house populated with fanciful monsters. The CGI stylization modulates the fear-factor; the film is more fanciful than frightening, but it is also wild and energetic. Filmed as if in a single, continuous take, the "Panic" suggests a motion-simulation ride, but instead of bouncing around like a pinball, audiences are poked in the back and dazzled by light and smoke effects that literally get those 3-D dust motes to float in the theatre. Intrepid is the one new maze. 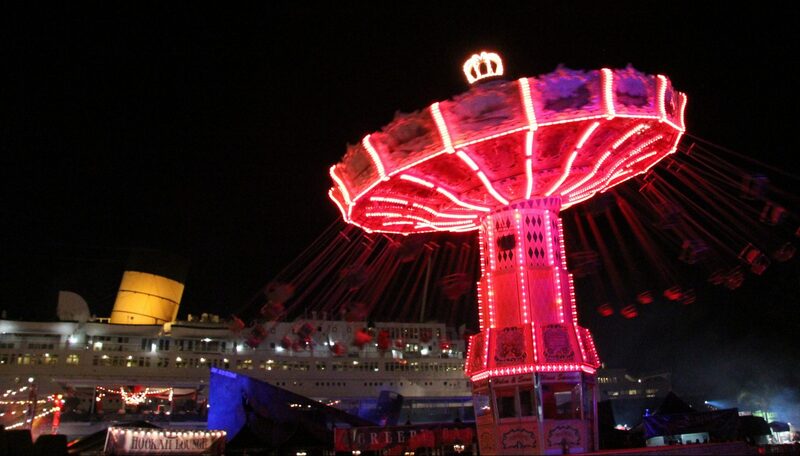 Like the Circus, it is located in the Dome on the shore near the Queen Mary. Also, like the Circus, Intrepid features a fun-house approach to the sets - not literally but in the sense that there is no attempt to simulate a real environment; it's all chain link fences, enhanced with a few nice set pieces (such as a cauldron pouring red-hot molten iron). 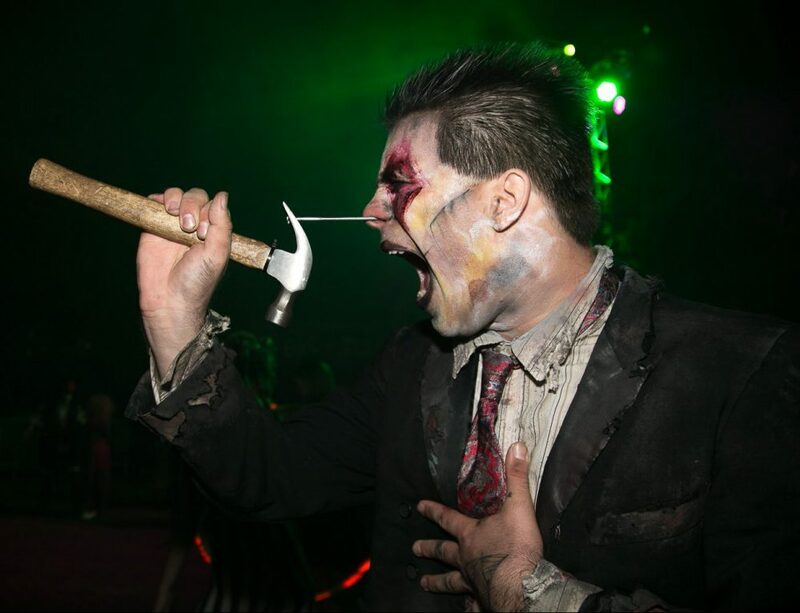 The concept is that Intrepid represents the foundry where the iron was forged to build the Queen Mary - which at least has the benefit of tying in with the star attraction of Dark Harbor. Not all of the ghosts accurately represented this theme, but we have to give the cast credit for working overtime to fill a not-too-exciting setting with abundant shrieks. The final new attraction is the Hex Paint Ball Gallery, which replaces last Halloween's Anubis Paint Ball Adventure. As disappointed as we were with Anubis, Hex is even worse: the one halfway exciting element - the presence of live actors as targets - has been removed, reducing this to a conventional shooting gallery. The black-light atmosphere is nice but not as intriguing as the Egyptian decor of Anubis. Save yourself the up-charge by giving this one a pass. Though not in a literal sense "new," we will mention Soulmate here, because it's been revamped into virtually a new maze. The abode of Graceful Gale, the eternal romantic searching for her perfect man (even if she has to stitch him together from bits and pieces of "donors), this maze is still situated near the stern of the Queen Mary, but the new path takes passengers on a trek through neglected areas last seen in 2014's Exclusive Encounter: past the propeller and deep down into the engineering section, before ascending back to the upper decks. The journey begins with an encounter with a woman in 1930s costume (perhaps Gale while she was alive? ), then features an angry captain behind the wheel; the familiar figure of Gale emerges later. The result feels a bit like two mazes joined together, and the long walk back up the stairs is a bit tiresome; nevertheless, we were glad to see Dark Harbor making more use of the Queen Mary's available space: the dark engineering section, overcrowded with pipes and metal railings, offers nearly unlimited hiding places for creatures lurking in shadows. We rank this year's version of Soulmate as somewhat of an improvement, thanks to the additional scare scene, but it is suffers from a weakened conclusion: the lofty, triangular "dance floor room," where Gale drifted with her masked suitors the past two years, is gone, replaced by a simple corridor, draped in fabric - a considerable drop in production value. Lullaby: If there is one reason to climb aboard the Queen Mary for Halloween 2016, this is it. Now subtitled "Hush Hush Don't Cry," the maze has been enhanced with some new props and effects, which use window panes and running water with ghoulish finesse to create an eerie impression of Scary Mary suspended beneath the surface of the pool where she met her watery death. Scary Mary returns in living dead form, manifesting throughout the lengthy maze. She as ubiquitous as the star performers in the Halloween Horror Nights mazes but with a crucial difference: Mary never wears out her welcome, because she offers more than repetitious jump-scares. In her dementedly playful way, she engages passengers, seeking new friends, and she will not take no for an answer. She likes to block your path and hold your attention past your comfort level, while her plaintive appeals rapidly modulate to angry demands, punctuated with wicked laughter. Though not billed as one, Lullaby turns out to be a de facto interactive experience, forcing engagement with spirit whose persistence extends beyond the grave and into eternity, as she materializes time after time, barely giving you a chance to catch your breath before she appears again (a truly disorienting effect achieved by casting multiple look-alike actresses). 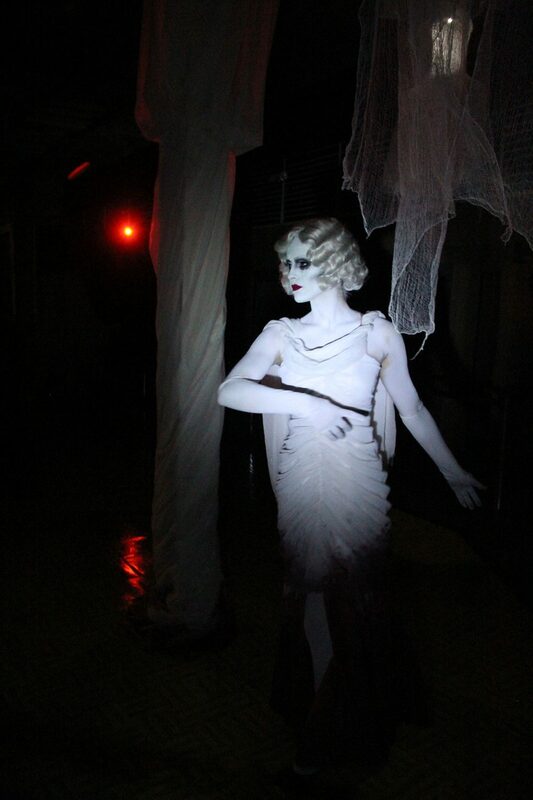 Lullaby is also one of the most immersive of Los Angeles Halloween haunts, thanks to excellent use of rooms and corridors aboard the Queen Mary. This is among the Top 3 mazes we have experienced this Halloween. As for the other mazes, we enjoyed B340 (also set on the Queen Mary) more than we did last year, though we cannot pinpoint exactly why, as there was little obviously new. 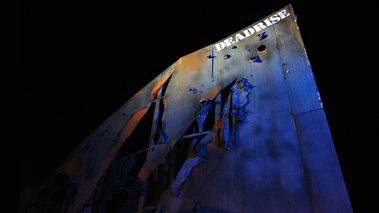 Deadrise was somewhat improved, with the addition of a false wall that forces passengers to retrace their steps until a ghostly sailor shows them the way to proceed; though we find its simulation of a ship somewhat lacking when compared to the reality of the Queen Mary, the walk-through benefits from nearby fireballs blasting through the night air, enhancing the sense of being aboard a damaged vessel. The Circus, set once again in the Dome, is really more of a fun house than a circus at this point. It's not our favorite theme, but the cast made the most of it, teasing and misleading visitors. There's a new bit at the beginning, an entry room that offers multiple paths into the maze: some are fake (leading immediately back to the starting point), but others do offer brief alternative experiences, which quickly merge back together for the majority of the way. Sideshow Freaks & Oddities has been rearranged but still offers much the same experience as last Halloween: for a small extra charge, you can enter a maze of oddities before encountering Sparky, the sit-down comedian skeleton. After a few jokes, Sparky sends you through a maze filled withe white fog and lurking spirits, which deposits you into a stage area where you can sit and enjoy a drink while watching spirited magicians, flaming jugglers, and other memorable entertainment. Of all the opportunities Dark Harbor offers to sit down and have a drink, this is our favorite. We would have rated it more highly this year, but Sparky's material was weak - he's usually one of our favorites, so we expect only the best from him. The Sideshow tends to be under-attended, partly because of the up-charge but mostly (we think) because it is mis-billed: potential passengers are likely to think it's a literal freak show, not realizing they are passing up what is essentially a separate entertainment experience, with its own mini-maze and stage show. Consequently, the stage artists sometimes find themselves performing to a half-empty house. The situation has been somewhat rectified this Halloween by placing the Sideshow back-to-back with the Creepy Cabanas (which you can rent for the "reasonable" price of $99). 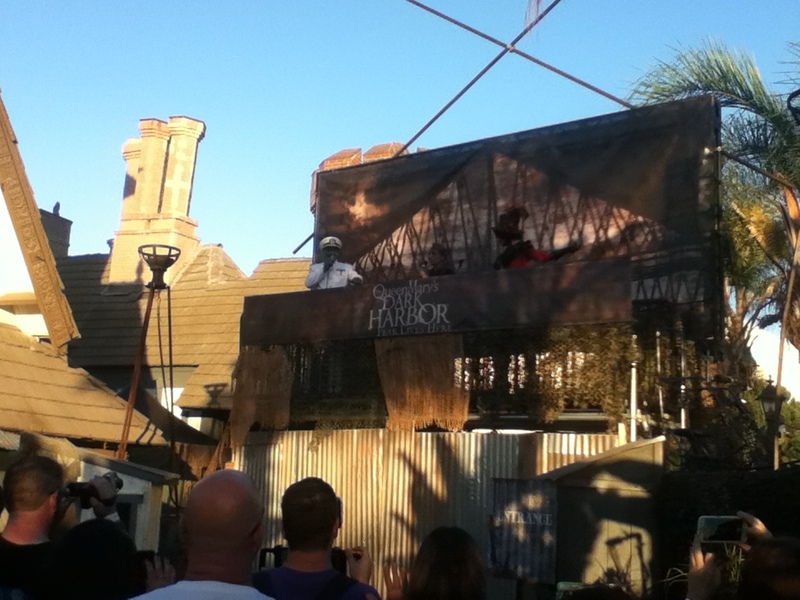 These private cabanas face the central area of Dark Harbor, but their back curtains open onto the Sideshow stage. This seems to be another stratagem in the Queen Mary's attempt to turn Dark Harbor into an upscale event for cash-infused dilettantes more interested in drinking the night away than in enjoying true Halloween spirits. Though we did take brief advantage of a Creepy Cabana provided for the press, we did not sample any of Dark Harbor's other upscale enhancements: those willing to drop a little extra coin into the Harbor's depths can get a private performance by Sideshow magician or sword-swallower; $99 buys a private tour through a maze, guided by its main character; and for $199, you can share a Tequila flight with the Voodoo Queen in the tasting house. As idle as a painted ship upon a painted ocean." The Queen Mary is not nearly as hopelessly adrift as the ship Coleridge described in "The Rhyme of the Ancient Mariner," but the venerable floating attraction is not exactly churning full speed ahead, either. The stormy seas surrounding the Dark Harbor seem becalmed, and the ship - which launched on its refurbished Halloween cruise to exciting fanfare five years ago - is now making little progress from one year to the next. It's as if the navigators have charted a course toward bigger sales by dropping anchor on several lucrative up-charge events: Hex Paint Ball; Sideshow Freaks & Oddities; Creepy Cabanas; private parties in the RIP Lounge. There is not a lot of innovation in the attractions themselves, and most of the changes this year represent subtractions rather than additions (no introductory rooms to the mazes, no maze in Fisherman's Village). Hollywood Gothique has long been a booster of the Queen Mary's Halloween events, in all their permutations, going back to the days of the Queen Mary Shipwreck. We still believe Dark Harbor offers a shipload of horrors, and our aging bones truly appreciate the condensed nature of the layout, with all attractions in easy walking distance, and with a wide variety of places to lounge and drink while recuperating before the next dive into the briny depths of doom. We just wish the Queen Mary would cruise into previously uncharted waters instead of sticking to well-traveled territory. Offer more novel entertainment like Panic. Avoid the simple fun-house style settings of the mazes within the Dome. Make better use of the ship and its haunted history. Utilize the immersive, interactive elements of Lullaby throughout the other mazes. And most of all, try to elevate the entire cast of characters to the level of Scary Mary. Paramount among the paranormal, Mary is the true Queen of Dark Harbor, and her royal presence keeps the haunted ship afloat this Halloween. ← Get discounts for Rise of the Jack O'Lanterns!